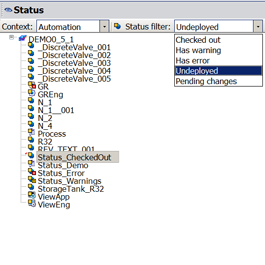 If you're a Wonderware System Platform (ArchestrA) user, how frequently do you find yourself searching for all of the undeployed object instances and object instances with errors, warnings and changes pending in your ArchestrA galaxy? How much time and effort is involved with those searches? The following short video blog demonstrates how you can streamline your troubleshooting process with a built-in Status View for your ArchestrA IDE, saving time and effort and allowing you to spend more time solving problems rather than trying to find them. It’s very common to make process flow charts or machine operational flow charts to help document and aid in troubleshooting. These charts end up in manuals, operator and maintenance training, and get pulled out when something is wrong and put to use. During a recent trip, I learned from one of our partners about how he’s seeing more users and machine builders take those paper drawings to a new level of interactivity. Although Wonderware has many powerful tools with wizards and other time-saving capabilities, designing visually dynamic and attractive graphics can still be an intimidating, time-consuming task for many reasons, especially when you aren’t a graphic or CAD designers. Given the typical level of customization required (with the resultant time/effort involved), creating graphics can eat up a big chunk of a project pretty quickly with respect to both time and budget. And, even over time, if you're an integrator (or even a user with a larger enterprise) focused on a vertical industry where a lot of the same graphics could be reusable, having the ability to avoid rework and additional effort is key to reducing costs and maximizing revenue. If you're nodding and interested in a more efficient method of generating ArchestrA graphics for your Wonderware systems, keep reading to learn how to reduce your efforts and the resultant cost of creating ArchestrA graphics by leveraging existing graphics sources. Designing visually dynamic and attractive graphics for use in your HMI or SCADA can seem like a daunting task to many who aren’t graphic or CAD designers. Speaking from personal experience, using packages like Adobe Illustrator or AutoCAD to create something from scratch that I’d actually want to use on a control screen is not an easy feat – I have a degree in marketing, not graphic design. For those who’ve been in this position before (and even those who haven’t – please keep an open mind), consider the benefits of using Microsoft Visio as a “design” tool for creating your graphics. Generational changes in the workforce and the accelerating pace of technological change are creating more and more demands on automation professionals. The ability to spend time re-drawing HMI screens from PI&D drawings or facilities layout drawings a luxury projects should not have to budget for in today’s environment.